Ever since the dawn of the New Order (and what a dawn it was), miners have been filing petitions against us. The petitions have all been denied--the New Order doesn't break any rules, after all--but that doesn't stop the petitions. One of the most common complaints is that we bump and/or gank while in non-deccable NPC corps. To my surprise, this complaint continued after I joined a player corporation. Even after most gankers joined New Order Logistics or some other corp/alliance, many miners continued to complain that we were in NPC corps. Tear goggles? Most carebears are completely disconnected from the rest of the game; they act as if it's a single-player MMO. But they still understand the power of complaining to CCP. It has delivered them many a gift over the years. Thanks to years of nerfs, suicide ganking is at "historically low rates", according to CCP. The carebears are unsatisfied. 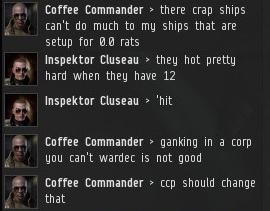 They're astonished that CCP has only eliminated 99% of the ganking, not 100%. 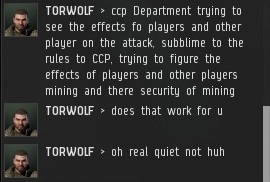 TORWOLF proves that even if one is incapable of expressing coherent thoughts, the message can still be sent loud and clear: Miners are entitled to peace. 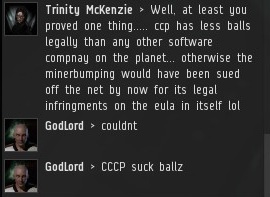 The miners frequently praise CCP for giving in to their complaints. 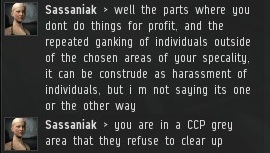 The moment a new complaint arises, however, they turn against CCP. Somewhere along the way, miners have gotten the impression that highsec is supposed to be 100% safe, rather than just 99% safe. Anything that gets in the way of mining must therefore be subject to a new rule or fix coming down the pipeline. Any delay in giving the carebears 100% of what they want is met with the utmost frustration. Doesn't CCP know they've got important AFK mining to do? Makalia articulates the credo of carebear "freedom": They are entitled to be free to do whatever they want--free from the disappointment and frustration of losing a ship. To preserve freedom, no one is allowed to do anything fun. So confident are the carebears of their risk-free future, many think it has already happened. 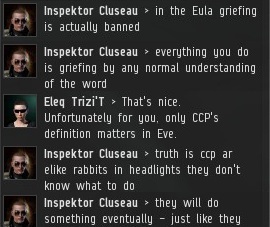 They are convinced that the inconveniences of player interaction have already been banned by CCP. The New Order is an educational institution: We teach the carebears otherwise. "The New Order is an educational institution." Truth! We are education and comedy rolled into one amazing package. Are you saying James 315 is not whining about the game mechanics? Ok he must have changed his mind my mistake :). 1. They are all alts of null and low-seccers, who have come to highsec to conduct market manipulation to benefit nullsec. 2. They are people who are unable to find the gates to low/null. Combining these two most common complaints, we see that the New Order is composed of nullsec residents, who, despite currently having multiple toons located in nullsec, are unable to find the way to nullsec with their market manipulation alt, who is in highsec intentionally to hunt highseccers for manipulation purposes, and also because he's lost. Bobbins, I think you should be very ashamed of yourself for making fun of New Order agents who have alts lost in highsec, despite currently living in nullsec and having an alt in highsec intentionally because traveling back and forth is a waste of time. Being lost is not much fun and nothing to mock people over, especially when they're intentionally located where they are and currently have most of their toons in the place that you absurdly claim they cannot locate. You are an evil man, accumulating negative Karma at a ferocious rate. More and more of there ships getting destroyed when they are trying to gank with 6 of 10 of there destroyers!!! As I understand it, 100% of the Knight's ships get destoyed during ganks. So an organization that is out to encourage ATK play and player interaction is stopped by people ATK and interacting with us? You see how we're winning? Welcome aboard! I only see the miners are winning and the ships waiting for new order to kill them and get the bounty! Yea, we lost a whole bunch of cheap t1 ships taking this whale down this evening. Yaknow, the entire time I've been flying with New order Knights, I've never once seen an op called off because of stationcampers. Never once a "Abort, lost too many off the station/gate/whathaveyou". Now, seen plenty of whoring on Concord killmails, but by that time, deeds been done, miner has done gone pop. Seen a couple capsules popped, but we fly those cheap, so no biggy. Sadly, facpo has a bigger impact on ganking ops, than other players do. I like this alot. Stupidity should be punished. Out of curiosity was he transporting or boosting? Bulkheads and damage control are a definite must when using an orca in any kind a dangerzone. They have just so much structure. He was transporting and boosting ... and had full cargo mods, cargo rigs, and a flimsy shield tank. An expensive loss in return for no permit tank and the ability to hold a little bit more ore in the cargo hold. What ever happened to the Red Pen List? With so many miners petitioning it seems like the list would be never ending. It seems the Red Pen has been escalated in power and importance. The last public use of it caused the entire movement to move to Gallente space to confront a Red Pen violator on his home turf. I could be mistaken, but I believe the Knights have made the Red Pen list obsolete. 10mn MWD for a Orca OMG !!!! Stupid Guy ...Good Kill !!! NO are just a Massive Trolldite ya'll keep trying to mine. Trolls have no purpose other than laughs; New Order is saving EVE. Thought crossed my mind it was a legitimate cause, but concidering how awful NO are at enforcing their "code" and with focus on people crying about their fail operation, theres only one conclusion and that's NO are a terrible bunch of trolls picking on a small percentage of miners that can't think outside the box. How is their operation "fail"? The incredible amount of screened proof this blog provides says otherwise. You have to give proof as well if you want to state that the operation is failing. You're taking a conclusion from a wrong premise. The real evidence we all can see is that high sec offers absurdly rewards for little to no risk (without NO, no risk at all), and in a game like EVE that ruins the game as a whole (butterfly effect, as CCP itself explains in a promotional video). Why is it fail? Because the only ones who are going to pay the fee are the AFK and the bot miners as they have the most to lose, it's not so much a permit payment as a back hander so they can continue doing what the NO operation is claiming to want to stop. Any miner can avoid damage by bumping and ganking simply by being at the keyboard, moving around or by using another mining source than the belts. Why would you pay a penny when it's so easy to avoid NO, unless you are an AFK or bot miner THEN it makes sense to pay the fee rather than come back an hour later to find they've mined 9 veldspar and the belt is now 10AU away. Screen shots are proving NO are winding people up, not that the operation is having any other effect. I don't disagree that it's ridiculously easy to make isk in high sec, I've played for around a week now and a few hours mining a day - as boring as it is, gives me more than enough money to get what I need, just for clicking a 'roid and F1. You have to take in account the Code. Buying a permit is no use if you don't respect the Code, for example if you keep mining AFK after buying a permit. But that is not the point...the New Order is providing something that high sec didn't have since a long, long time: emergent gameplay. People are fighting, making opinions, trying suicide ganking, trying to resist the Order, talking about it, writing blogs, preparing for voting for James 315 and his vision for the CSM...the New Order is showing what really makes EVE a game like no other: the fact that good players can take control of gameplay and even create it, and a single exceptional person can suddenly influence the whole galaxy. This is the greatest victory of the New Order! Now, for the important matter...let's rebalance the risk - reward ratio for high, low andd null sec. Let's make EVE an even nicer sandbox!